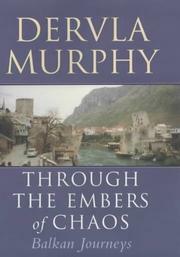 I have discovered a new author to add to my 'favourites' list: Dervla Murphy. She is unbelievable and I'm looking forward to reading more of her books (one is already lined up on my shelf, come back soon for a review). I have seen Dervla Murphy mentioned by other travel writers from time to time - Paul Theroux springs to mind - but never got around to checking her out. You know, so many books, so little time... I picked Through the Embers of Chaos because it's about the Balkans, not because it's by Dervla, but she's impressed me so much that now I'm prepared to read a book on anything as long as it's by her. What a colourful person she is! Just consider the basic idea for the book I'm reviewing today: cycling through post-war Balkans, at seventy??? She also drinks, smokes, dislikes health & safety regulations and shuns political correctness. I'm almost in love. By the end of page 18 of Through the Embers of Chaos I had read three fragments aloud to my partner. You will understand the significance of this statement when I add that he really doesn't like when I do that, so I pester him only when I come across something truly exceptional. Murphy's writing is colourful, full of life and raw emotion but without fake sentimentality. She radiates spirit of adventure that is dangerously contagious - one almost wants to hop on a bike and go exploring. Her opinions are radical, but full of compassion and humanity - qualities rarely seen in our spineless, materialistic media culture. Libraries have been written about the recent Balkan conflicts. I have read quite a few of those publications, trying to make sense of what had happened, but I have to admit Murphy's explanation surprised me (in the positive way). She voices heavy criticism of NATO and arms-dealing corporations, realpolitik and hypocrisy of the 'international community'. I couldn't help agreeing with plenty of her accusations. Perhaps her arguments convinced me, or maybe she aimed too close to my own favourite villains... Either way, it was good to see the shining armours tarnished a bit. Truth to be told, Murphy failed to present a convincing alternative solution to the Balkan problems. It would be welcome after so much criticism. Still, Through the Embers of Chaos is a fantastic book.